Stem cell use has been a highly debated clinical technique due to some of the unethical methods of retrieving the stem cells. Stem cells are widely thought of as blank cells that are used to create and reproduce any type of cell in the body and are made from human embryos. They are thought of being unethical due to their source being the human embryo. The debate on this topic has caused the technique to become illegal. However, there are a few other types of stem cells that are thought of more ethical and for this reason are able to be used clinically in a legal manner. In the study “Generation of stem cell-based bioartificial anterior cruciate ligament (ACL) grafts for effective ACL rupture repair” conducted by Dimitrios Kouroupis et al. 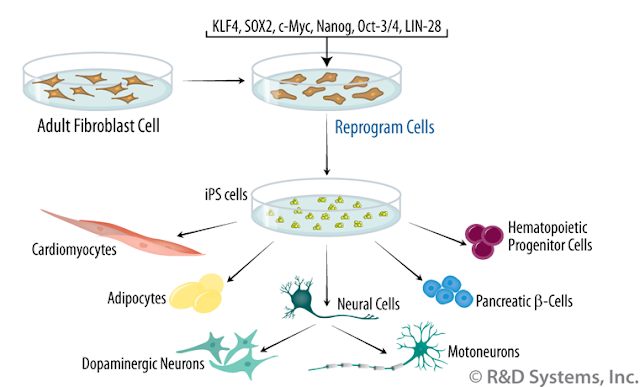 They use two different sources for Multipotential Stromal Cells (MSCs). Adipose Tissue (AT) is commonly known as fat tissue and is one source for MSCs while the other source is biologically engineered. Induced Pluripotent Stem Cells(IPSCs) are blank slates created from recombinating ordinary cells from the patient. Both of these MSCs were used to engineer a Bio Artificial ACL. An Anterior Cruciate Ligament graft is made up of two different types of connective tissue but split into 3 sections, the tendon itself, and then the two bone fragments at the ends to be inserted into the femur and tibia. So the bioartificial ACL was constructed with those parameters in mind. By growing cultures of these MSCs on a biomaterial medium the Bio Artificial ACL developed over time to become fully functioning. Through a PET-CT scan the graft that was inserted into the swine patient was shown to be metabolically active. This technique of creating Bio Artificial ACLs over using the patients own body to harvest a graft proves to have less morbidity and A shorter rehabilitation time. Through a patellar tendon graft the patient can have from 5-24 months recovery before the graft becomes fully woven into the body's composition. However many issues can occur during the process of harvesting the patellar tendon graft. Therefore if this new method using MSCs proves to be beneficial over normal ACL grafts then it could be a huge leap in the clinical field. Ryohei Uchida, Shuji Horibe, and Norimasa Nakamura did more research on the effect of IPSCs and MSCs had on ACL repair. The difference between the two studies is that in this one they used Mesenchymal Stem Cells (MSCs) which are derived from bone marrow. This study focused on the results of trying to repair a partially torn ACL by injecting the IPSCs and MSCs into rabbits who through magnetic resonance imaging (MRI) were found to have partially torn ACLs. Results showed that the the ACL reconstruction done using MSCs had better functioning biomechanical properties than what resulted from regular ACL reconstruction. I feel that resources should be invested into human trials for this new technique for ACL reconstruction and ACL repair. If proven to be a more beneficial and more efficient technique then it could also be used for many injuries to the body.